A school and a kindergarten have been shelled in Slavyansk as the city becomes increasingly unsafe in the intensified Kiev military campaign. At least 9 civilians were injured in Wednesday’s shelling incidents, including a child. 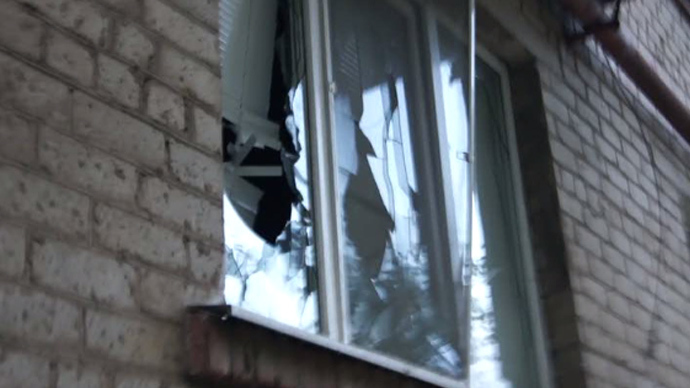 Ukrainian mortar shells have for weeks been raining down on the checkpoints and positions of the Slavyansk self-defense, but much of the shelling occurred outside the city. Italian journalist Andrea Rocchelli and his Russian interpreter, veteran human rights activist Andrey Mironov, were almost “torn to pieces” in one such shelling. However, this week the battleground apparently moved right into civilian quarters of Slavyansk, as shells started hitting residential blocks and nearby buildings, killing three people on Monday. On Wednesday, there was a shocking reminder of how the situation might unfold if the likely president-elect Petro Poroshenko pushes on with the military operation in the region, as shells struck the city’s streets, yards, a school and a kindergarten. RT talked to a male schoolteacher from Slavyansk school number 13, who asked not to be named. “Around midday there was a loud explosion in the school, and I fell to the floor, taking cover,” the teacher told RT over the phone. The man said that he rushed to the corridor to assemble all the teachers and children in the school and take them to a safe place. 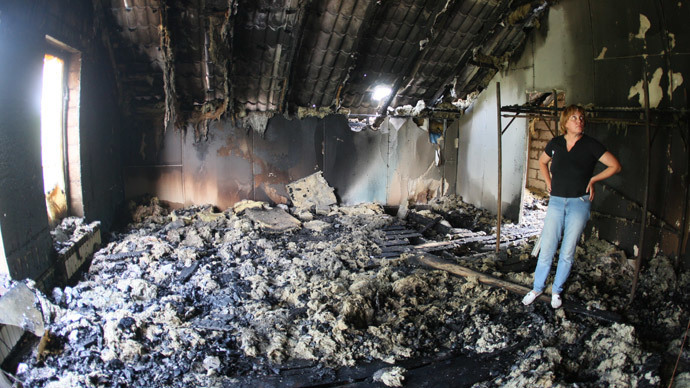 Clouds of dust were billowing on one side of the building. Luckily, no children were in the hall at the time. All the pupils and teachers were quickly evacuated to the basement. Photos of the sites of Wednesday’s mortar attacks emerged on social media, showing partially destroyed buildings, craters in the roads, and what appeared to be blood. 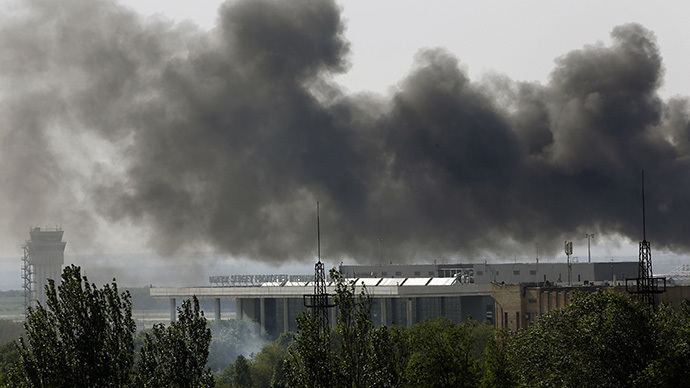 “Currently, we are confirming the information on the terrorists’ shelling of the residential quarters and the territory of the school in Slavyansk,” the commander of Kiev’s military operation in southeastern Ukraine, Vladislav Seleznyov, wrote on his Facebook page. 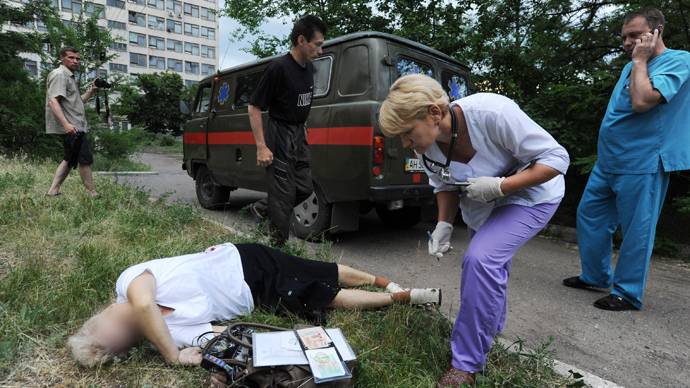 Meanwhile, several funerals of those killed in Monday’s shelling were held in Slavyansk on Wednesday. According to the latest reports, four people have died from shrapnel wounds since then. The shelling damaged a block of flats and a dormitory in the city’s teachers’ college, shattering glass in the windows of the college. Power lines and, reportedly, a city water pipeline were damaged and disrupted by the blasts. While the Kiev authorities keep asserting that the military action in the southeast is meant to protect the people against “terrorists,” many people on the ground in Slavyansk have a directly opposite opinion on the issue. 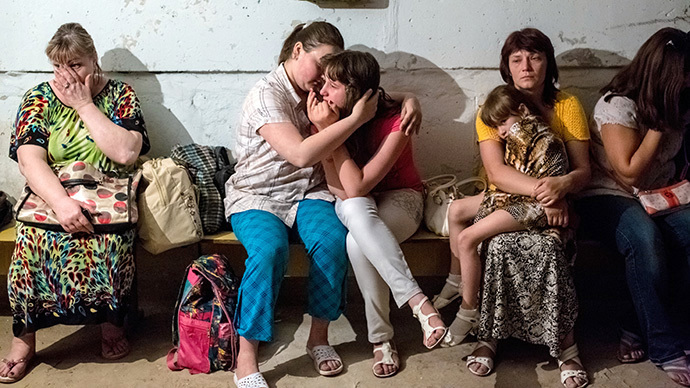 “For some reason, they think that we here in Slavyansk are all terrorists,” the woman said.